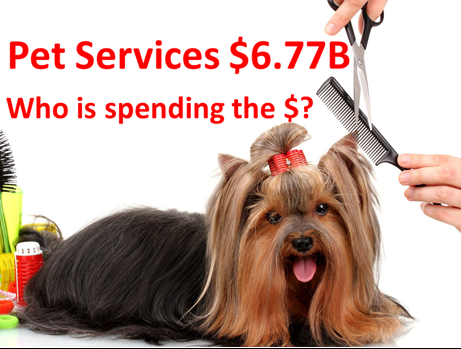 Now we will look at the last and smallest segment – Pet Services, the only Segment with a spending decrease in 2017. Spending totaled $6.77B which was down, -$0.07B (-1.0%). The drop was slight but a big change for a segment that has grown consistently since 2011. Services Spending is the most discretionary of any segment so higher income is definitely the dominant factor in consumer spending. We have categorized 2017 as a year of Value. This was true for Services too. The number of outlets offering services increased radically. This competitive market produced a lot of deals as retailers vied for the Consumers’ $. While the CPI didn’t deflate in 2017, Services had the lowest inflation rate since 2010. Consumers in all income ranges seek value. They bought a little more often but paid a little less. As expected, this caused some turmoil. Let’s look a little deeper. Let’s start by identifying the groups most responsible for the bulk of Services spending in 2017 and the $0.07B decrease. 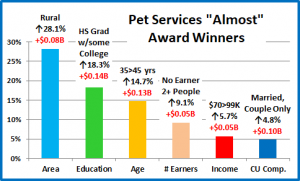 The first chart details the biggest Pet Services spenders for each of 10 demographic categories. It shows their share of CU’s, share of Services spending and their spending performance (Share of spending/share of CU’s). The differences from the products segments are immediately apparent. In order to better target the bulk of the spending we had to alter the groups in four categories – income, education, age and occupation. The performance level should also be noted as 7 of 10 groups have a performance level above 120%. This compares to 7 for Veterinary, 6 for Supplies and only 5 for Food. These big spenders are performing well but it also indicates that there is a large disparity between the best and worst performing segments. Income is absolutely the biggest factor in Services Spending. The categories are presented in the order that reflects their share of Total Pet Spending which highlights the differences of the 6 matching groups. Race/Ethnic – White, not Hispanic (87.9%) up from 86.8%.This big group accounts for the vast majority of spending in every segment, especially Services. Their performance improved from 124.3% to 128.3% and they moved up to #6 in terms of importance in Services Spending. Minorities are 31.5% of CUs but only generate 12.1% of Services $. Housing – Homeowners (86.4%) up from 85.7%. Homeownership is a major factor in pet ownership and spending in all industry segments. The Homeowners’ share of Pet Services spending is 86.4% which is the highest of any industry segment. However, even with 137.4% performance, homeownership is only in 4th place in terms of importance for increased Pet Services spending. Their slight share gain came only from an increase in homeowning CUs. # in CU – 2+ people (79.8%) up from 79.0% The share of market for 2+ CU’s is very close for all segments but lowest in Services. Their performance of 111.9% is down from 112.4% and tied for last. Essentially, they were flat for the year. 2/3-person CUs spent more, but 4+ CUs cancelled the gain. The overall share gain came from a drop by singles. Occupation – “I’m the Boss” (72.2%) up from 69.2% – The “ I’m the Boss” group consists of Mgrs & Professionals, Self-employed and retired CU’s. This “bossy” group has a large and growing market share and a performance rating that increased from 138% to 141.3%. This ranks them 3rd in terms of importance. These increases were driven by a strong year from the Mgrs & Professionals segment. Income – Over $70K (71.2%) up from 66.7% The gain in share primarily came from a big increase from the $100>149K group along with a big drop from $30>69K. These indicate big changes in usage. The over $150K CUs also spent 6% less but they probably just got a better price. Services doesn’t break the 100% performance barrier until Income exceeds $100K and then it skyrockets up. This group’s performance rating is 185.2%, up from 180.2% and absolutely shows that CU income is the single most important factor in increased Pet Services Spending. Education – College Grads (68.8%) down from 69.8% Income generally increases with education. Services spending moves up strongly with each increasing level of education. This is why we shifted the group up to College Grads. Performance of 161.9% was down from 171.7% but a college education is still the 2nd most important factor. # Earners – “Everyone Works” (64.9%) down from (67.4%) In this group, all adults in the CU are employed. Income is important so a relatively high market share is expected. However, their performance fell to 113.3% from 120.1% and they dropped out of the 120% club. The drops were a due to a strong year by 1 Earner, 2+ CUs and retirees. CU Composition – Married Couples (64.5%) down from 66.0%. Married couples are a big share of $ and have 120+% performance in all segments. Their performance fell to 130.3% from 135.8% but they stayed in 5th place in terms of importance to Services spending. The decreases were primarily due to a big lift from Unmarried 2+ Adult CUs along with drop in spending by the Married, Oldest Child <6 group. Age – 45>74 (64.0%) down from 69.0%. Their performance also dropped significantly from 133.7% to 124.5% and their ranking fell from 6th to 7th. The decreases were primarily due to the 45>64 age range spending significantly less, but in 2 ways. The entire group spent 13% less $ for every service. However, the 45>54 yr olds increased their frequency by 5% while the 55>64 yr olds decreased theirs by 2%. Much of this drop for the whole age range was due to value shopping. Another factor was increased spending at both ends. The <25 and 75+ groups both spent more. Area – Suburban (62.2%) up from 58.7% in share, while performance increased from 107.0% to 111.9%. The lift was due to a big spending increase by small Suburban areas, under 2500, along with a decrease by Central Cities. We should also note that Rural spending was up 28%, mirroring their performance in other segments. We changed 4 of the spending groups for Services to better target the biggest spenders. Higher income is even more important to Services spending than it is to Veterinary, where we changed 3 groups. Both Services and Veterinary have 7 groups with performance over 120%. However, the performance levels in Services spending in categories related to income are markedly higher. This reinforces an even bigger spending disparity between the segments in Services. 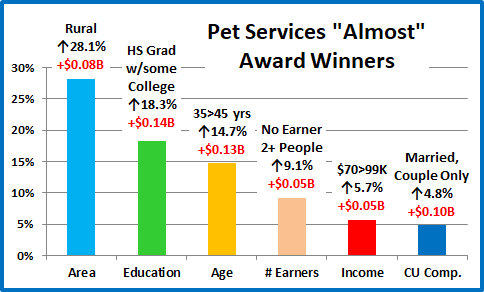 Now, we’ll look at 2017’s best and worst performing Pet Services spending segments in each category. Income is even more important to Pet Services. While the 398.8% Performance by the $200K> group is less than last year’s 426%, it is 39% higher than Veterinary and 123% higher than Food. # Earners – 2 Earners – Last year it was 3+ Earners. Both are high income and the only segments in the category with 100+% performance. The winner reflects the outstanding year by 2-person CUs, especially Married Couple Only. Age – 65>74 – This group certainly has an increasing need for Pet Services. However, their income is low. Most are now Baby Boomers, who traditionally spend more on their pets. This group spends 1.1% of their total CU expenditures on their pets. This is second only to the 55>64-yr old group. Only age groups between 45 and 74 have 100+% performance in Services spending. Occupation – Mgrs & Professionals– They took the Income top spot from Self-employed so this switch makes sense. CU Composition – Married Couple Only replaced last year’s surprise winner, Married Couples with an oldest child under 6. In 2017 the only 100+% performing CUs with kids are Married, with the oldest child over 6. Area –Suburbs <2500 – This area spends a lot of money on their pets, but they truly had a great year in 2017. Amazingly enough, their 148% performance in Pet Services was the lowest score that they had in any segment. Race/Ethnic – It’s not only about income. Asian Americans have the highest income of any Racial/Ethnic group, but they finished last in Services spending performance. This is because they have a low percentage of pet ownership. Comment – College Grads spent the most $ so it is not surprising that they have the biggest changes. What is interesting is that < College Grads led by HS Grads w/some College spent more, while College grads spent less. Occupation – Mgrs & Professionals, the highest income group, had the only significant increase. Comment – The white-collar Tech, Sales, Clerical group and Retirees spent a bit more while Blue-Collar workers and Self-employed spent less. Region – Once again the winner and loser flipped from last year. Comment – The Northeast also had a small increase. Income – 2017 was a year of mixed messages and tumult. Comment – Try to follow this: Under $30K was up, +0.5%. $30>50K was down a lot, -33%. The $50>70K group was down a little, -4%. Then the $70>99K group turned it around, +6%. The $100>149K segment took off, up 32%. Time for a final turnaround. The highest income, over $150K group spent 6% less. Value shopping, cutbacks and increased frequency. 2017 had it all. Area Type – Suburbs <2500 led the way but Rural areas also spent more. Comment – After 2 winning years, Central City flipped to last. Suburbs 2500> has had 2 consecutive down years. Housing – After 2 years, Homeowners w/Mtge, the largest segment, returned to the top spot. Comment – Homeowners w/o Mtge flipped from 1st to last. Central Cities also spent less. Age – In a big surprise, the 75+ group had the biggest $ increase. Comment: The 55>64-year olds flipped from 1st to last. Their drop, combined with a decrease of -0.17B by the 45>54-year olds created a situation that couldn’t be overcome by the other age groups. In addition to the 75+ year olds, the 65>74, 35>44 and <25 age groups all posted spending increases. # in CU – As we have noted, it was a great year for 2 Person CUs, with a big increase in every segment. Comment: In 2017, 4 People CUs flipped from 1st to last. 1, 4 and 5+ person CUs spent less on Services. Only 2 or 3 people CUs spent more. CU Composition – An Unusual winner – Unmarried, 2+ Adult CUs. Singles were down so you definitely needed 2. Comment – Married Couples Only had the second largest increase. In terms of CUs with Children, all married couples with an oldest child over 6 and even Single Parents spent slightly more on Services. # Earners – 1 Earner, 2+ CUs was the clear winner. Comment – 2 was the magic number. All CUs with 2 or more people and 2 or less earners spent more. Race/Ethnic – African Americans had a big percentage increase, but they only have 4.5% of total $. Comment – White, Non-Hispanics also spent more, but only 0.3%. Asians spent $0.07B less (-44%). We’ve now seen the winners and losers in terms of increase and decrease in Services Spending $ for 11 Demographic Categories. 2017 was a tumultuous year. The winning increase in each category averaged +$0.25B (+26%) while the biggest decreases averaged -$0.27B (-23%). That certainly shows a “mixed bag”. We didn’t see any major trends. Income became a little less important, at least in term of the number of Earners. The oldest groups had a strong year. 2 Person CUs, married or unmarried, performed well. We also saw a spending move towards less populated areas, like other segments. The $0.07B decrease was the first since 2010, but even in a decline there are some segments that performed well but didn’t win an award. They deserve…. In 2017, Pet Services spending fell for the first time in 7 years. The drop was only 1% and it wasn’t pervasive across the marketplace. 55 of 99 segments did spend less, but 44 spent more so there was some good news. The segments in the graph reflect some minor movement towards more equalized spending in some categories – education, age and even income. Services also mirrored a trend we saw in other industry segments. Spending tended to migrate towards less populated areas, both Rural and Urban. The Services segment has usually been “above” changes in other segments. Since 2010 prices have steadily increased but so has Spending. 2017 saw a change. An increase in outlets offering Services created a much more competitive environment. While prices didn’t deflate, inflation slowed significantly, and “deals” abounded as Retailers began a pitched battle for Consumers’ Services $. The net result was turmoil and a 1% decrease in spending. Pet Services are definitely needed by some groups. However, for most demographics, Services are a convenience and spending is very discretionary in nature. The result of this is that CU income is of paramount importance to increased Services spending. This impacts many demographic categories and we adjusted the big spender groups in 4 categories specifically to accommodate this difference in behavior and to better target where most of the $ are coming from. Just how important is income? 38.4% of CU’s have an income over $70K and account for 71.2% of Services Spending. This is a performance rating of 185.2% – the highest rating earned by any big group in any category in any industry segment. The biggest producers in these groups are all prime candidates to produce increased Services $ and all are categories in which the consumer can exercise some degree of control. The Racial/Ethnic and Age Categories also have high performance numbers but the consumer has no control over their inclusion in these groups. All 5 of these groups have a performance above 130% and are at their highest level in the Service Segment. This indicates a huge disparity between the best and worst performing segments in the category. This disparity is greater in Services than in any other Industry segment. This does make it easier for industry participants to more effectively target their best customers and identify those demographic segments most in need of improvement. However, some of these may need a lot of help. At Last – The “Ultimate” Pet Services Spending Consumer Unit consists of 2 people – a married couple, living alone. They are White, but not of Hispanic origin. At least one of them has an advanced College Degree. They just turned 65 but both of them continue to work, in managerial positions. They’re doing well with an income over $200K. They live in a smaller suburb, near a big city in the Western U.S. and are still paying off the mortgage on their home.